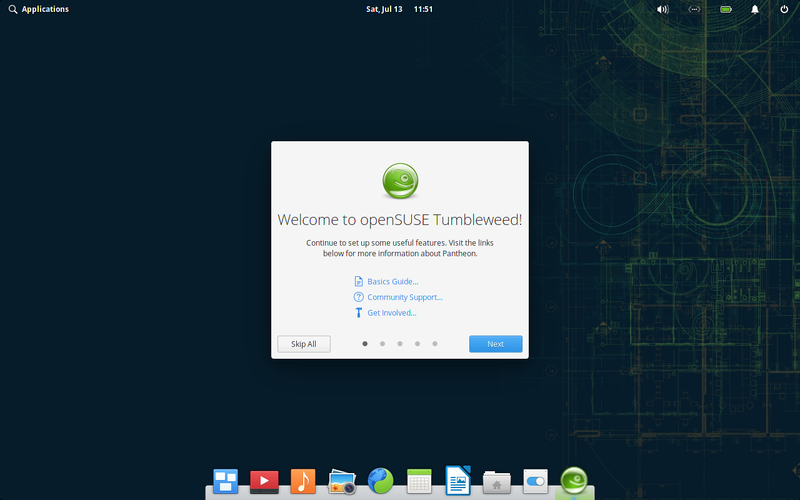 The Pantheon shell is the main desktop component of the Elementary project. It is deeply integrated with other applications like the dock called Plank, the top panel Wingpanel, application launcher Slingshot and comes with its own window manager Gala, which is based on Mutter. The traditional Unix like substitutability of components is sacrificed by a design philosophy that streamlines the user interface for better global aesthetics and out-of-the-box experience inspired by popular proprietary desktops. To do that, the Elementary project enhances the Gtk+ libraries with its own extensions for improved usability and a unique design. It also comes with its own set of programs that all adhere to the visual guidelines like the text editor Scratch, the file browser Pantheon Files, the web browser Midori, the terminal emulator Pantheon Terminal, the desktop calendar Maya, the e-Mail client Geary, the software gallery AppCenter the video player Audience and the audio player Noise as well as the Switchboard control panel. To simplify application creation designed for Elementary, an application development framework (Granite) was created. The preferred programming language is Vala. Warning: The packaging of the elementary project for openSUSE is still in early experimental stages. Development is done in the X11:Pantheon project on OBS. Everyone is welcome to join the team. You can meet us at the #opensuse-factory channel on Freenode IRC. This page was last modified on 12 March 2018, at 22:03.